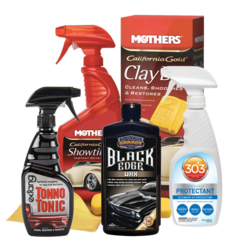 There's only one car care products company that restores and maintains its own collection of over 125 vintage muscle cars. To take care of them, we personally created the best detailing sprays, waxes, exterior and interior cleaners, tire & wheel products, and metal polishes ever. And unlike competitors who outsource development and manufacturing, we make everything right here in the USA. No wonder we're the fastest growing car care products company on the planet. At Surf City Garage, Your Ride's Worth It.